Presenting our *Members Only* Lunch & Learn series, new for 2019! Make your lunch break a productive one, by learning from your fellow IBA Members! Bring your own lunch, and join us at Industrious Coworking at Broad & Locust for a new session each month. Space is limited – please contact us if you can no longer use your registration. 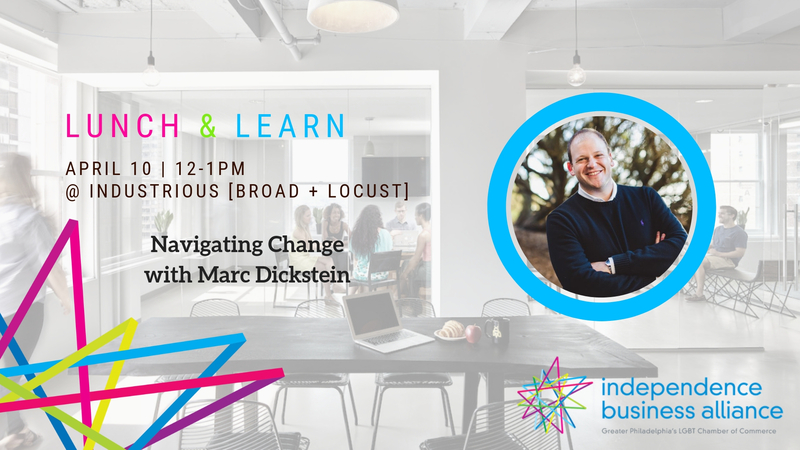 Marc Dickstein is a Certified Professional Coach and Founder of Plus Marc, a leadership development and coaching practice that empowers individuals, teams, and organizations to become the best versions of themselves. Through 1x1 coaching programs, workshops, and offsites, Marc collaborates with those who strive for greatness, engagement, and fulfillment at work, home, and everywhere in between. Recent partnership highlights include: Comcast, Squarespace, First Round Capital, Udemy, General Assembly, and The University of Pennsylvania. For ten years, Marc led people, operations, event production, and marketing teams in retail, media, and technology. Marc is a Board Member, Coach, and Co-Founder of Out in Tech, a non-profit that unites 20,000+ members of the global LGBTQ+ tech community. He is a graduate of the University of Pennsylvania and currently leads PennGALA, Penn's alumni LGBTQ association. Marc has lived in New York City, San Francisco, and he now resides in Philadelphia with his husband, Mark, and the cutest Miniature Schnauzer on the planet, Bubby.